Hi, there; thanks for dropping in. Welcome to my little corner in cyberspace. My name is Vincent and I hail from Sandakan, Malaysia which is located on the north-east of the island of Borneo, about 3 hours by air from Singapore or Kuala Lumpur. Here's a map. Sandakan a relatively small city of about a quarter of a million - officially, that is. If you took into account the number of illegal immigrants here (mainly Filipinos and Indonesians), we'll be looking at probably thrice that amount. Sandakan's main industry is agriculture - oil palm, to be precise - whilst her claim to fame is undoubtedly the world-renowned Sepilok Orangutan Sanctuary located about 15 miles from the town centre. After working for a major international bank for 19 years, I took the big (and potentially perilous) leap into business in 2003. 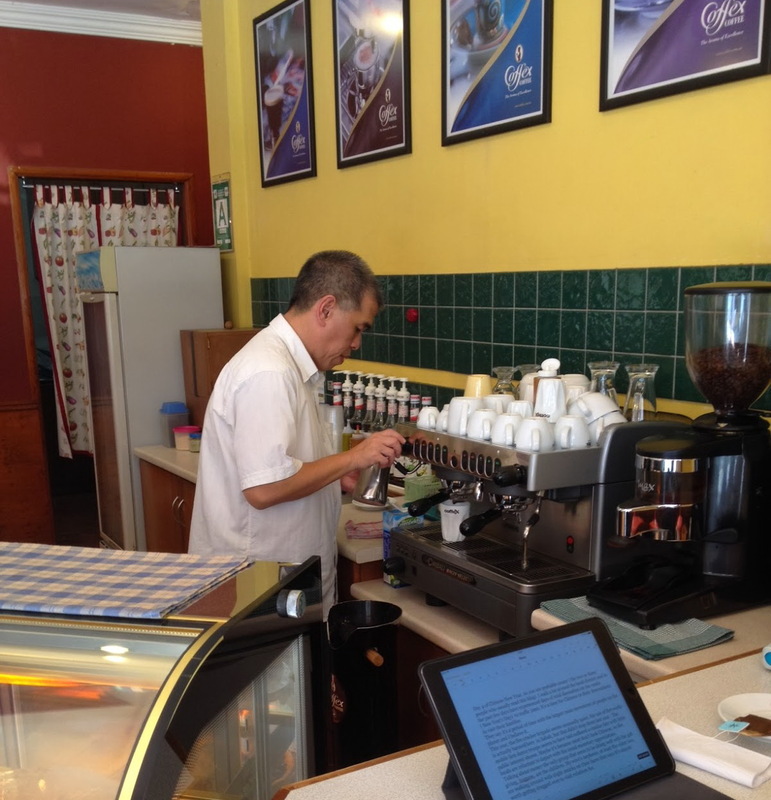 I am now a barista by vocation and have been running my own coffee shop since June that year. I work hard - between 12 and 14 hours a day. I also tend to play hard. By that, I mean seeing as much of the world as I can. My passions are travelling, football (Liverpool supporter since 1982) and, of course, writing. That's me doing my "thang"
My appetite for travel is insatiable. Places which my wife, Oi Len, and I have had the good fortune of visiting so far include Japan, Australia, Cambodia, England, France, India, Indonesia, Singapore, Liechtenstein, New Zealand, Qatar, Scotland, Switzerland, Vietnam and Argentina. The both of us are culture freaks and, to satisfy our interest in the ways of others, we incessantly seek to add to that list.... that is, whenever we can afford to do so. I started this blog back in December 2011 basically to feed my curiosity about this fad called blogging. Suffice to say I got hooked big time and haven't looked back since. I wouldn't consider myself a prolific blogger as I average only about a post a week. At best. To be honest, blogging to me is like rediscovering an old passion. As a kid, I aspired to be a writer but possessed neither the creativity nor the literary flair to feasibly go down that road - so here I am small-time writing about coffee, coffee shop wisdom, football, what I do, lessons I've learnt, things I know (and wish to know), my country, places I've seen, places you should see, my experiences, my musings, my hopes. So, as you can see, mine isn't a specialty blog. But the fact remains that I enjoy writing. My desire to see my work in print (unashamedly) has never waned - and with a bit of persistence, hard work and, above all, luck, who knows? I'm always seeking to improve the layout and content of this blog and, in this respect, warmly welcome any constructive suggestion(s) and/or feedback that you may have. As with any blogger, little else motivate me more than hearing from you - my readers. A note - even a line - telling me how some of the things I write here may have touched you will more than make my day. Once again, thank you for popping in. And remember, if you like my blog, please share it with your family and friends by clicking on the social media button(s) of your choice at the top of each page. Have a great day, everyone.... and if you're ever in town, let me know; coffee's on me. You'll find the contact buttons on the sidebar of this page. Hello there, Valia. Thanks for your comments. I'll definitely keep that in mind, thank you. My wife and I plan to visit Barcelona in May 2016 for one week on holiday. I was wondering if your offer is still valid. Since the last time we corresponded, I have travelled to Argentina and stayed at the Hostel Suites chain and write about them on my blog. Feel free to take a look por favor.